I’m wrapping up my visit here at Cosmoprof, but before I head back home I wanted to share with you guys one more great product pick that caught my eye. Cracked heels and dry feet may not be the sexiest topic out there, but it’s a common problem for many people, one that causes pain, suffering and embarrassment. 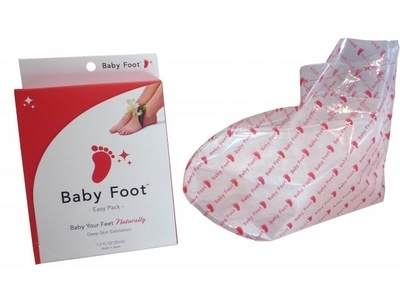 A new product from Japan called Baby Foot is making its U.S. debut here at Cosmoprof and it’s definitely generating a lot of buzz. The product consists of two booties–they can accommodate women’s size 4-12 and men’s size 4-11–that are chock full of exfoliating fruit acids. The acids work to break up the dead skin cells on your feet that cause that dry, cracked appearance. Simply slip on the booties, secure them in place and then do your thing while wearing them for two hours. This gives the product enough time to absorb deep into the layers of the skin. After the two hours are up, remove the booties and wash your feet of any remaining product. The results are not instantaneous–you have to wait 2-7 days while the dead skin cells dry and begin to peel away. Since the acids literally break up the dead skin cells, those cells will physically begin to peel off. It’s a little gross at first; almost like you’re molting, but once those dead cells have been removed what will be uncovered is soft, undamaged skin–baby feet. Right now the product is only available on the brand’s website, but there were a lot of retailers buzzing over it at the show, so expect to see this little gem in stores near you soon.